Risott-oh! Another item crossed off the list. But, I really think I should add it back to the list. And make it again. And again. And again. And again. Do you know what I learned? 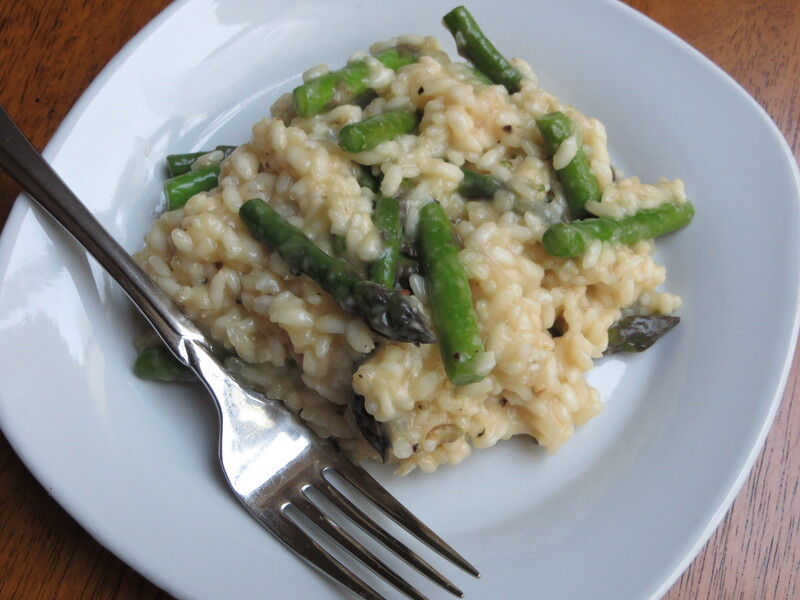 Risotto is not difficult to make! 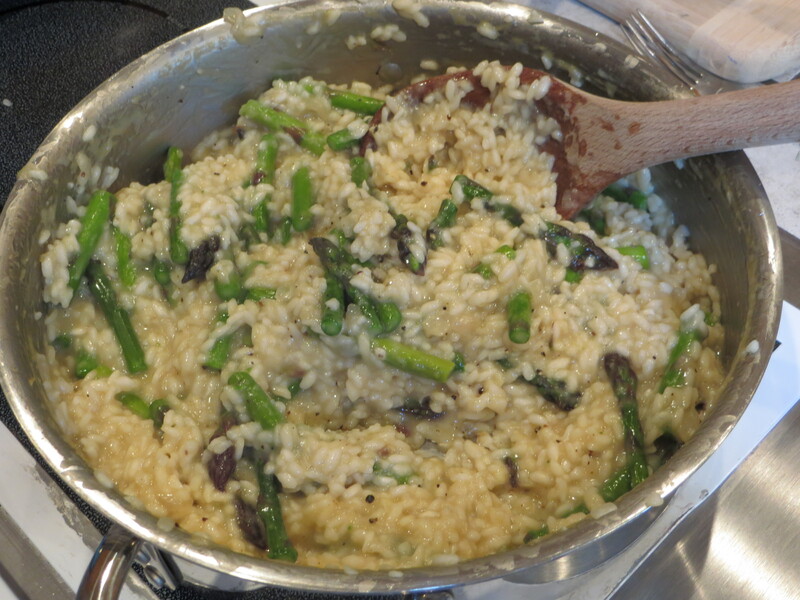 I’ve wasted so many years not making risotto!! Those days are over. I must thank Jessica Erin over at Stuck on Sweet for this recipe. Thank you, thank you, thank you!! First, the ingredients. Simple and few! They fit on one medium-sized cutting board. 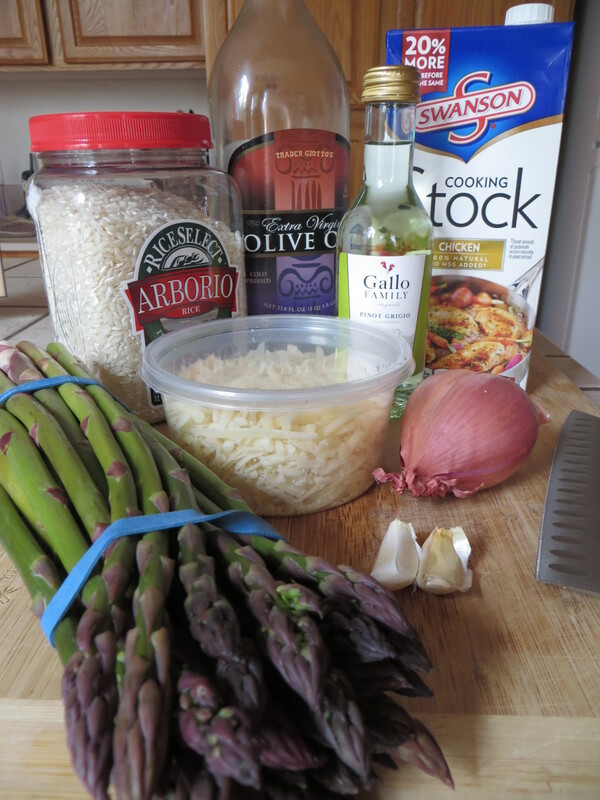 Arborio rice, chicken stock, white wine, garlic, shallot, olive oil, parmesan cheese, asparagus. Those few ingredients create this amazingly creamy, cheesy, nutty, creamy dish. It has an al-dente bite to it that makes it…toothsome. Did I just use that word? Yes. Yes, I did! 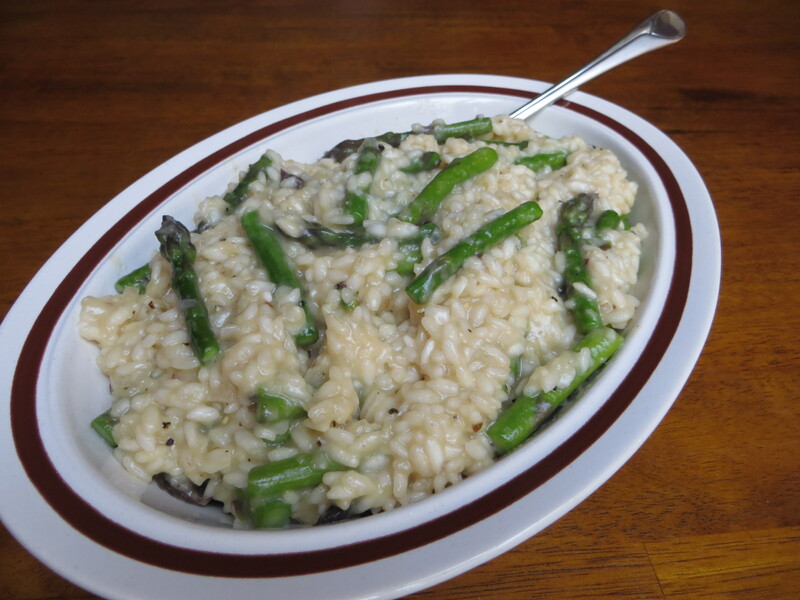 The asparagus is a great spring-time addition. We served it with a beautiful t-bone steak. However, it would also be amazing with a simple grilled chicken breast. Add a green salad and you have a meal to remember. 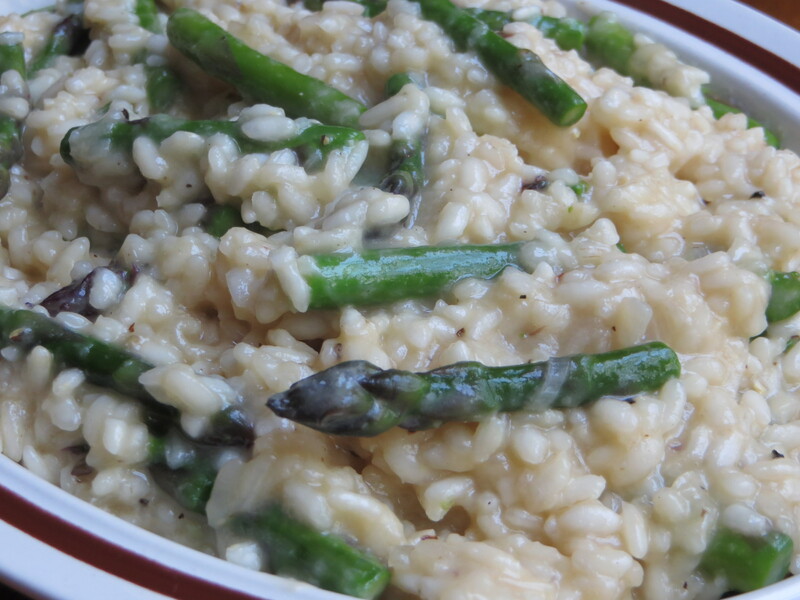 And the risotto is the star. Heat the chicken stock in a sauce pan until simmering. Reduce heat but make sure stock remains hot. In a fry pan heat olive oil over medium heat. Add the shallot and saute for 2 minutes until translucent. 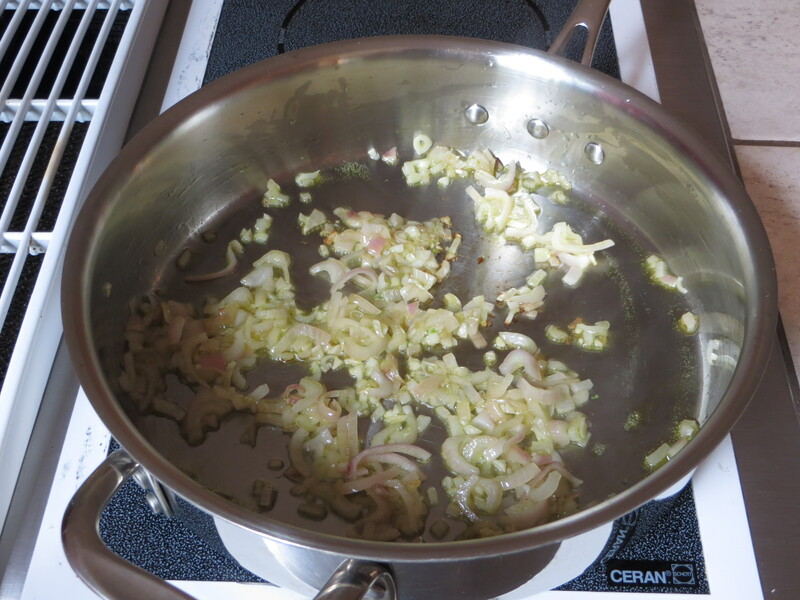 Add the garlic and saute an additional minute. 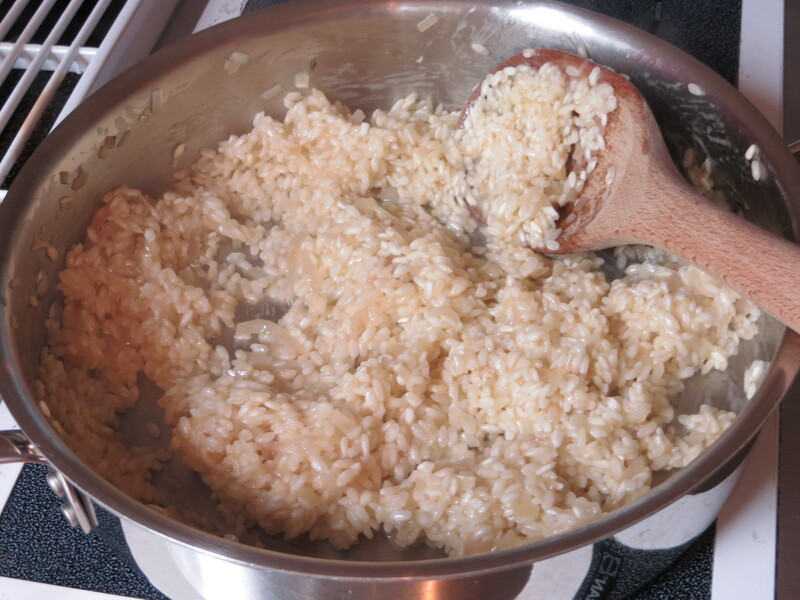 Add the arborio rice and stir to coat with oil. Saute for one minute. Make sure the rice does not brown. 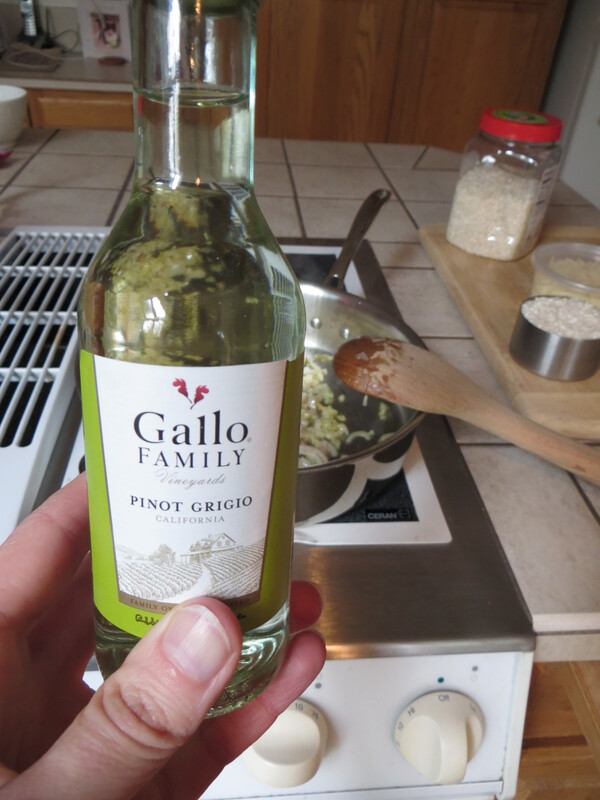 Add the wine and cook, stirring, until the liquid is fully absorbed. 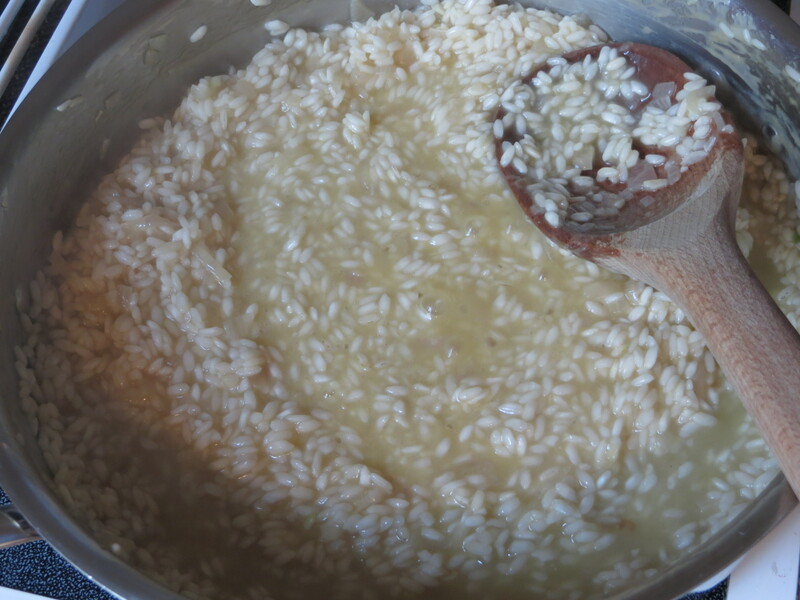 Once the wine is absorbed, add a ladle of the hot stock to the rice and stir until fully absorbed. 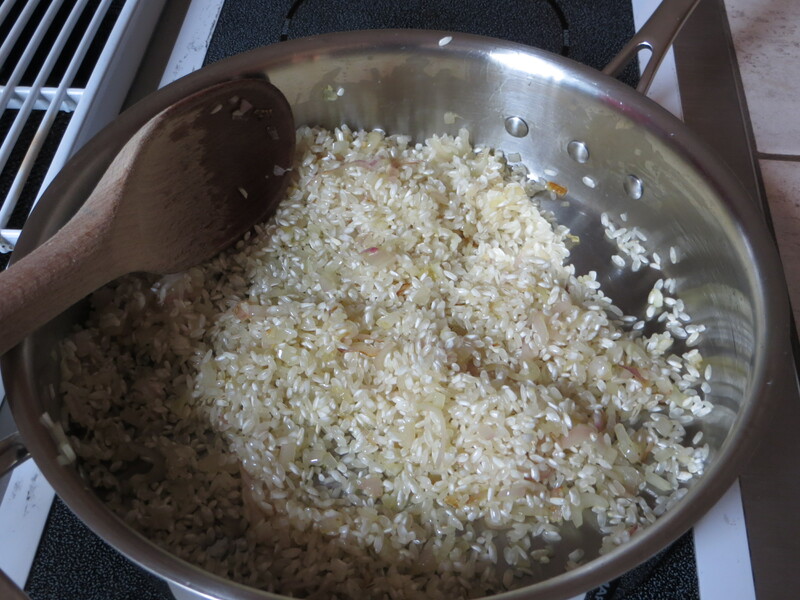 When the rice appears almost dry, add another ladle of stock. Repeat until there are two ladle-fulls left. 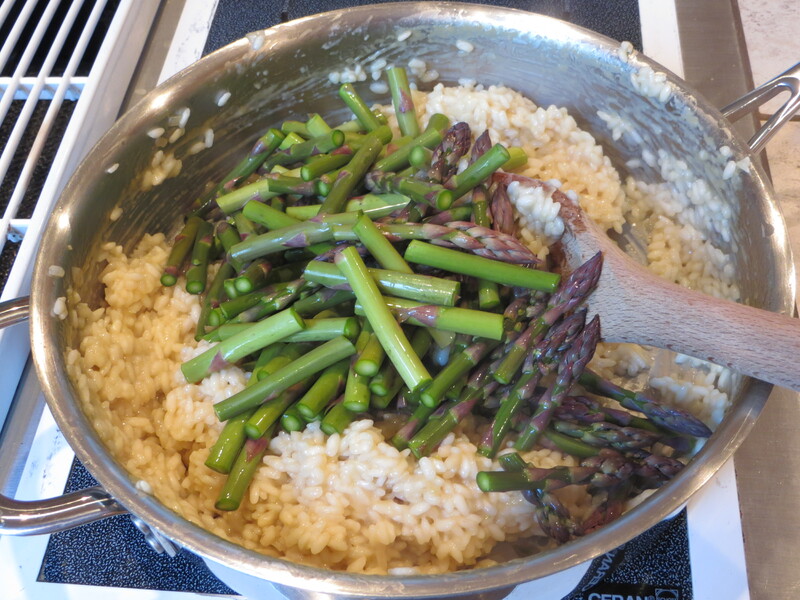 Add the asparagus and another ladle of stock and stir gently until the stock is again absorbed. Add the last ladle with the cheese, stirring until almost absorbed. Season with salt and pepper to taste. First, the shallots and garlic. I’ve never really understood shallots. They resemble a mis-shapen red onion and tend to run on the expensive side. I elected to stick with the recipe and bought shallot, but will probably just do regular white or red onion next time. You heard me. Next time. There will be many risottos in our future. Next, add the white wine. A note on the wine: we aren’t really white wine drinkers. We prefer red. So, I’m always reluctant to buy an entire bottle when a recipe calls for 1/2 cup. We feel compelled to drink the remainder of the bottle, but we may not fully enjoy it. I’ve found that the little “single serve” bottles, while expensive, are a great solution when you need a small amount for cooking. It doesn’t take long for the wine to absorb. Now it’s time to commit. 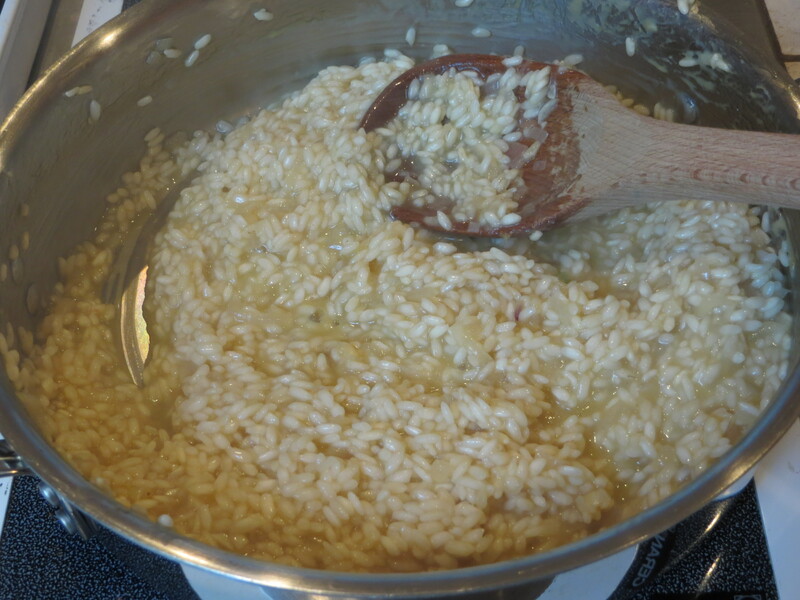 The key to risotto (look at me, speaking like a risotto expert. 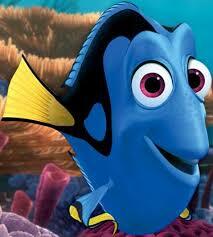 Not an expert, just a voice of experience) is patience. Just keep stirring. Keep stirring. Stirring, stirring, stirring. You get the idea. Below are some of the stages. First photo is the look you can expect when you’ve added stock and it’s absorbed to the point of “dryness.” Photo on the right is just after adding stock. Below that is in the later stages when it starts developing a “creamy” look. I cooked the risotto on medium heat the entire time. I found that it took about 5 minutes for each ladle-full of stock to be absorbed. Of course, there will be variation from stove-to-stove. Total cook time from the first ladle-full to ready-to-serve was probably around 35 minutes. Like I said, a time commitment. But worth every creamy bite.